The Avery Research Center would like to celebrate the lives and accomplishments of two supporters, Emily Spencer DeCosta and Janet D. Hicks. Emily Spencer DeCosta was born in 1923 in Washington, D.C. to James Spencer and Evie Carpenter Spencer. In 1942, Emily received her bachelors degree from Virginia State College; in 1943, she earned a master’s degree from the University of Michigan. She taught English at Virginia State College for three years and while there, she met Herbert A. DeCosta, Jr. In 1946, Emily married Herbert DeCosta and began working for his construction company as the bookkeeper, office manager, and corporate secretary from 1947 until her retirement in 1985. Emily and Herbert had two children, Gail Spencer DeCosta and Margaret Craft DeCosta. In spring 2010, Julia Ellen Craft Davis and Vicki Lorraine Davis generously donated the Craft and Crum Family Papers to the Avery Research Center. 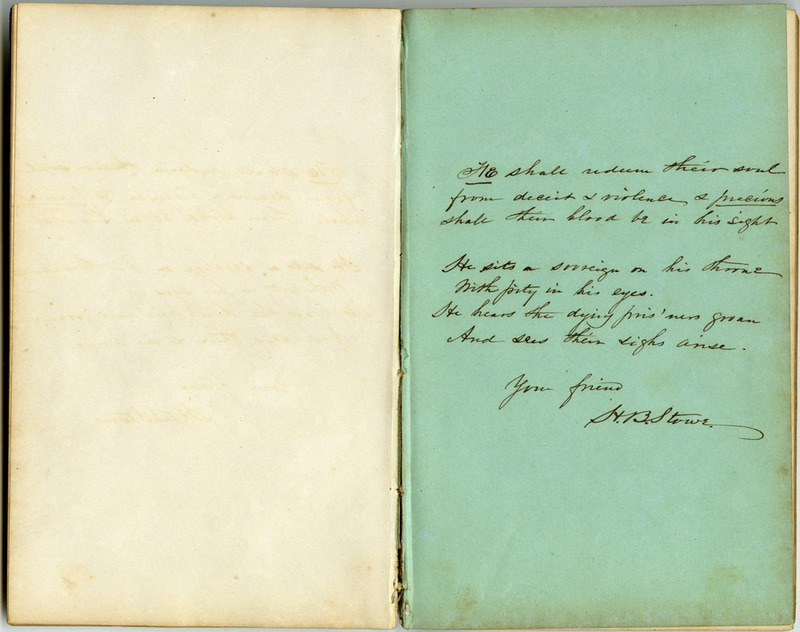 Archivists and historians alike are delighted with the major highlight of the collection: a tribute book to William and Ellen Craft, enslaved people from Macon, Georgia who completed a daring escape and became internationally known celebrities. 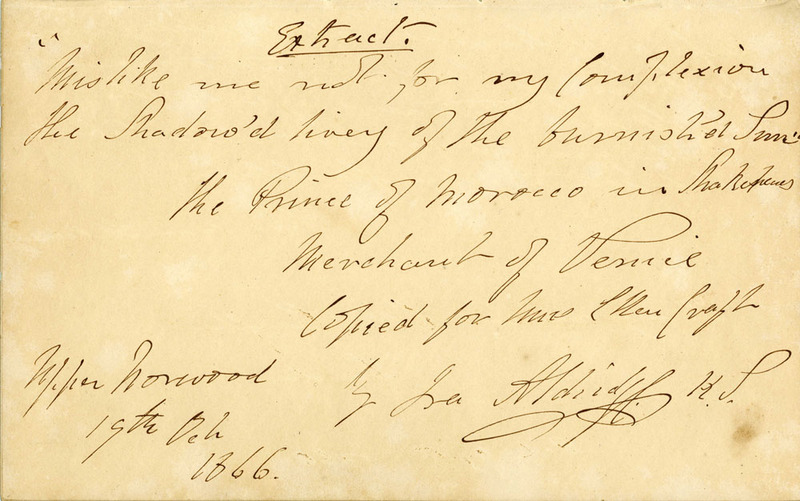 Ira Aldridge quotes the Prince of Morocco from William Shakespeare's The Merchant of Venice. Opening the slim volume for the first time, Avery staff members gasped at the handwriting of thespian Ira Aldridge, an African American from New York who graced the London stage in the 19th century. Though celebrated in England and the European continent, Aldridge also faced enormous prejudice due to his race. 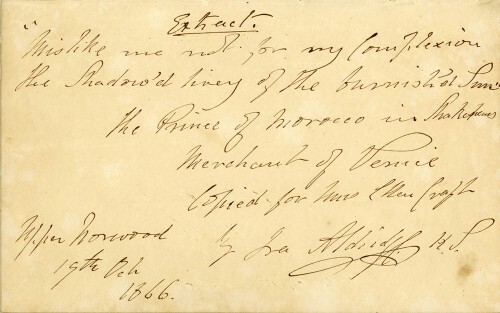 Invoking the sentiments of the Prince of Morocco in Shakespeare’s Merchant of Venice, Aldridge quoted, “Mislike me not for my complexion, / The shadow’d livery of the burnish’d sun.” With these words, Aldridge welcomed American refugees William and Ellen Craft to England and issued a shared plea for equality. Created upon the Crafts’ entrée into English abolitionist circles, this tribute book contains passages and quotations written by well-known supporters, including the American author Harriet Beecher Stowe as well as Ira Aldridge and his wife, the Swedish countess Amanda Aldridge. A cartes-de-visite album of these figures, the Crafts, and other abolitionists such as Frederick Douglass and William Lloyd Garrison provides a rich visual counterpart to the volume and hints at the international importance of these materials. Harriet Beecher Stowe quotes two biblical passages as she writes to the Crafts. But just who were the Crafts and how did they emerge as public figures in the transatlantic abolitionist movement?